In 1963, with Kiwi caravanning in it's infancy, Geoff and Wendy Button were considered by many to be quite mad to be starting a caravan business. Relocating their business to Normanby three years later confirmed local suspicions of idiocy beyond doubt...everybody including their accountant thought they were "the crazy pair with a few caravans in a paddock". Others saw Normanby as a tiny rural settlement - and it was in those days. But Geoff and Wendy looked beyond the boxthorn hedges, the dirt track and the turnip paddock to see a site full of potential. Situated on State Highway 3 it had high traffic exposure, with plenty of parking and was not hemmed in by other businesses. Asking themselves "Why do we see things differently to everyone else?" they set to and cleared the site with scythes and mowers, in readiness for the first caravans. '' The rubbish was piled so high it towered over the fence" remembers Wendy who, with Geoff, carted 4000 concrete tiles off the property. "It was a hard weekend's work but by Monday the caravans were on site and White Heather at Normanby became a reality". The entrepreneurial couple christened their fledgling business White Heather - a talisman of good luck in Scotland - a memorable name which Wendy & Geoff dreamed would become well known around New Zealand and the world. When they unearthed a whisky bottle bearing the name "White Heather" on the very site they planned to do business from, it was confirmed: "we were meant to be here!" Nearly half a century on, White Heather endures, and the bottle discovered decades ago still shines - used as a lamp at home. They had their site, they had caravans and people wanting to buy them and trade their cars in for them.....but the council stepped in. What were these people doing selling vehicles from a non-commercial property? 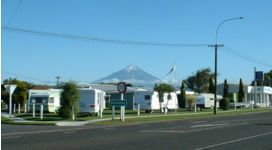 Battles over signage and zoning were waged until, after extensive lobbying, Wendy and Geoff managed to convince the bureaucrats that White Heather was an asset to the small South Taranaki township. "We were improving Normanby and putting it on the map. Anyway, eventually we were able to gradually spread out, purchasing two neighbouring houses and a dairy - over a period of 8 years we had extended over the whole area of the Southern approach to Normanby." Today White Heather is a thriving, vibrant place, laid out like a park for everyone's enjoyment. We have new and used caravans, cars, motor homes and campers, plus a large camping division with a year round expo of tents erected to make it easy to choose the correct one for each person's individual requirements. Our stocks of camping, tramping and caravanning equipment are second to none. For motor home builders, we can supply any equipment you may need, for caravan owners we carry stocks of most parts that you would require. Mail order is a large part of our business. All our vehicles are presented in pristine condition, both new and used. Everything is serviced in our modern automotive workshop by certified mechanics. They are then groomed to as near perfection as we can get them in our groomimg bay, which includes a sewing shop where we repair awnings and tents, and manufacture new awnings to order and accessories such as sunshades, stoneguards, drawbar covers, windbreaks etc. All tyres are checked and replaced if necessary in our tyre bay, where they are fitted and balanced. We have a wide range of trailers of all sizes and types and we are very proud to be representing Kiwi built caravans, built for our conditions, with layouts that Kiwis have always enjoyed, Leisureline Platinum & the all new Zephyr (a Kiwi revival)! We enjoy being able to suit individual requirements for caravan designs. Yes, White Heather is unique in New Zealand. We can offer you one-stop service second to none. Geoff and Wendy are still here to serve you with their vast knowledge and experience gained over the years, together with their son Ross, who has grown up with the business, and their team of dedicated staff. We invite you to browse our website for some of the various products we have on offer. Unfortunately we cannot show you all we do, but please contact us with your queries, we will endeavour to assist you, and make your leisure pleasure complete. Geoff, Wendy, Ross and the White Heather team.